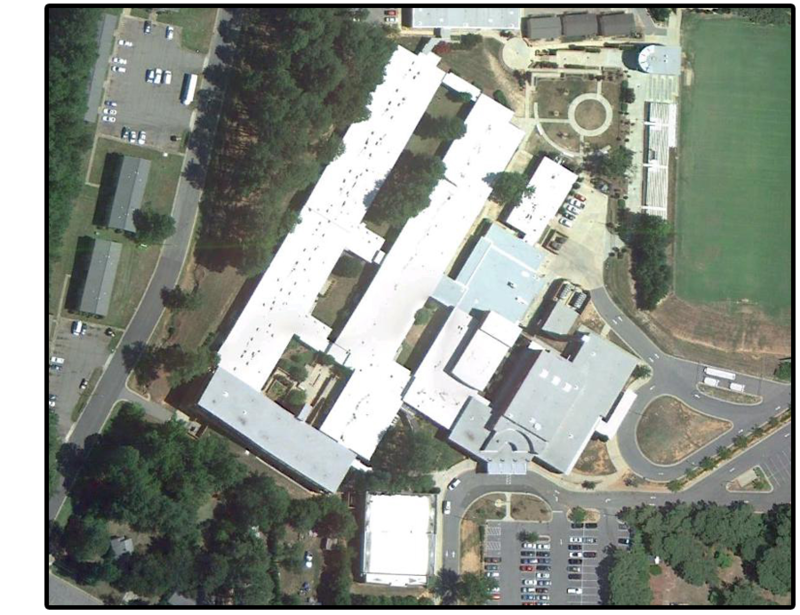 Many low sloped, commercial and industrial buildings in America have an EPDM roof membrane on their building. EPDM is a roofing material made out of a very durable synthetic rubber consisting primarily of propylene and ethylene. EPDM is often applied in large sheets that are rolled out onto the rooftop and mechanically fastened to the roof. Over time, the seams on these roofs begin to fail causing leaks and other issues to occur. Luckily, you can apply an acrylic roof coating system to restore your roof to new, while gaining benefits that will provide you with cost savings. Acrylic roof coatings are sprayed directly onto the EPDM roof membrane, creating a monolithic covering with no seams or joints - even around pipes, roof top equipment and drains. Roof coatings significantly improve the waterproofing of EPDM roofs by eliminating T-joints, a right angle joint or seam between two membranes in the form of the letter “T”. These joints create water channels which overtime negativity impact the waterproofing capabilities of the EPDM as the sun’s heat cause these seams to fail and allow water to infiltrate into the building, forming leaks. Interested in restoring your aged and failing EPDM roof? National Coatings has several different acrylic roof coating systems and products that are extremely reflective and do not require a costly and timely roof tear-off or replacement to occur. Our AcryShield roof coatings are tested and rated by several third party organizations such as the Cool Roof Rating Council, Energy Star Certified Roofing Products, Title 24 Compliant and more. Click here to download our FREE Product and System Brochure for more information. There are many different roofing options to choose from in the roofing market but not all of them provide an easy, non-intrusive, and cost effective solution. Installing a roof restoration system over your existing roof membrane can save you thousands of dollars, a great deal of time, and provide you with many other benefits you did not even think of. Read the list of benefits below to learn why roof restoration using a roof coating system is so popular. Roof restoration systems restore your existing aged or failing roof with 50-70% less costly than a tradition roof replacement. Roof restoration is much less labor intensive than a roof tear-off. A roof tear-off requires tearing off the existing roof substrate, gathering and removing the old roof from the site to a landfill, and then following up with the new construction to build the new roof. These stages require business closures and ideal weather conditions. Roof coating systems do not require you to close your business during application, allowing you to conduct business as usual and create sales during the installation phases. Installing a roof coating system is minimally disruptive - no seams welding, drilling or nailing is performed during installation and no odors or harsh chemicals are used to apply the coating system. It is sprayed on in stages ranging from 3 to 5 steps depending on the roof coating system you select. Landfills in America are overly congested. We as a Nation are constantly trying to “recycle”, “reuse” and “go green”. Restoring your existing roof opposed to tearing it off, disposing of it and starting new, is an excellent way to recycling and reusing your current building materials. Many AcryShield roof coatings are LEED compliant for sustainable sites, energy and atmosphere, and materials and resources. 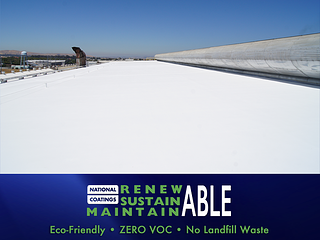 AcryShield also has a line of roof coatings that produce ZERO VOC’s or volatile organic content. Many roof coating systems are renewable every 10 to 15 years after the first roof coating system is installed, allowing you to avoid a roof replacement/tear-off indefinitely! It is no wonder why we believe re roofing is the best choice for fixing your aged or leaking commercial roof. With money and time savings, as well as, environmental benefits, roof restoration systems are the most ideal. To find out if you can benefit from one of these systems, contact us today or for information on roof coatings, download our FREE ROOF BUYERS GUIDE!